Some of you may have noticed that we have more and more to do with other clans. We support them in some ways and help where we can. In return, we are building a great community allowing us to bring in more skill, more events and the ability to have more interclan activities. This will strengthen us as a group to be bigger and better. We are therefore starting a so-called Clan Family. 1st Clan to join is will be Boereraat ! (#YY0LRVRG) They are a strong clan in their own ways. Level 10 clan will excellent war stats, but they are a more “younger” clan. By younger I mean lower Town halls and also some younger players, although this is not the case with ALL members. This is a trial and will be a new venture for both clans, so there will still be many obstacles to face things that need to be discussed and decided on. But once we’ve set the basic we will be looking to recruit a few more clans to our Family of clans. Please note that everything in the clan will still be managed as usual and each clan will have their own rules and own co-leaders. So when visiting respect such rules and their leaders. We will clarify the finer details as we get to them. Also... If you have a clan in mind that you feel may fit into the family, then please let me know. Cocsac will be launching a new website soon, we’ve worked hard on a new user friendly website providing more information and also a more professional look. With the new website clans will be able to sign up for tournaments and prepare up to a year ahead. Rules will be set out clearly and there will be some guides and forums available for discussions. I am one of the organisers on COCSAC so we will always be up to date with all details. This is another Tournament that spun off COCSAC giving the slightly weaker teams a chance, however this has no opened to pretty much everyone and seems as though they are hoping to offer a tournament once a month too. I have been asked to be on the Admin panel for them too including Jaco from Sofa King Good, Lisa and her brother Lewyne from DawnofDstruxion. 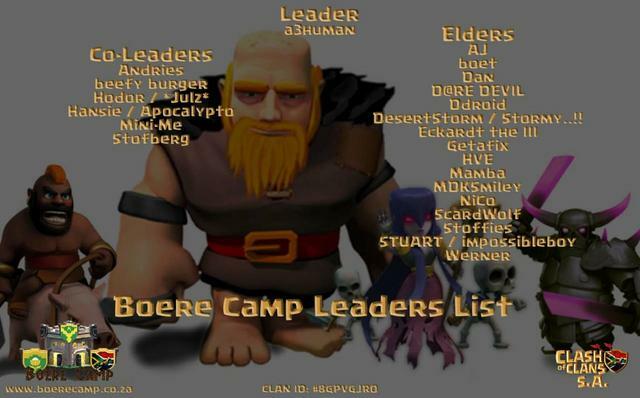 BOERE CAMP - Well done reaching 5th place on the trophy ladder. Unfortunately, this was at a time that the API did not refresh, so not recorded and we did not manage to stay there for end of season. But still a good effort and achievement. BOERE CAMP 2 - Well done on your winning streak - Sadly winning streak has reset due to a 100% draw. But back at square one and you're building on the streak again! Not yet beaten! Well done! BOERERAAT! - Well done in competing in your very first Tournament and making it to the finals! Keep it going and lets win this one! In Boere Camp we've had a few promotions - Congratulations to those who earn eldership & those who became Co-Leaders. Let's be the best we can be!